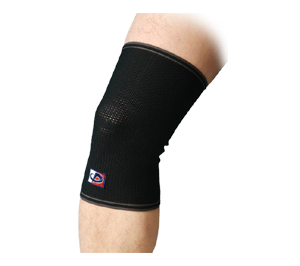 Targeting the critical knee joint, these unique supports are entirely permeated with Aqua-Titanium. Micro Titanium Spheres are also printed on the inside for increased effectiveness. The supports help ease the tension and pain of sore muscles along with joint pain in the elbow or knee. Click on icons under the default picture for measurements. 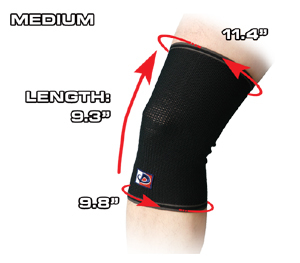 The Knee Supports stretch approximately 4 - 5 inches from the measurements listed. This Phild effect is the basis for the Energy Transport System. The Phild Processed material regulates the body's energy flow by stablizing ions. Injury, fatigue, and low oxygen levels hurt the efficiency of your cells, disrupting the normal flow of energy in your system. This increases the tension and fatigue in your body as it tries to compensate for the lost energy. Phiten products stabilize the energy, permitting a greater flow of energy with less waste. Fatigue sets in later and recovery time is shortened. Aqua-Titanium is permeated into fabric just like dye; each strand becomes permanently embedded with Titanium nano-particles. In nature, titanium is not a soluble material. However, by utilizing the high-intensity Phild Process, Phiten scientists are able to dissolve titanium in water. This creates Aqua-Titanium, which then can be absorbed into material just like a dye. The Aqua-Titanium becomes part of the fabric and can not be washed out or fade away. Aqua-Titanium most prominently used in our necklaces and apparel, where the entire fabric is permeated with Aqua-Titanium and emits energy that effectively controls your bio-electric current. Micro-Titanium Spheres are perfectly spherical, miniscule beads. These are mixed into compounds and then printed or layered directly on to the material. Miniscule beads of titanium are created using the Phild Process. These perfectly spherical beads can then mixed into a compound to be printed or layered directly onto material to target specific areas of the body with concentrated effectiveness. The inside of Phitens body supports are printed with Micro-Titanium Sphere print zones. The hexagonal patterns you see are actually a Micro-Titanium Sphere compound, printed onto the fabric to target specific areas with concentrated effectiveness. In certain products Aqua-Silver is used as well for its anti-bacterial and odor-reducing properties.